Light, airy, delicate pastel puffs of mouth-watering deliciousness, the French Macaron is an absolutely exquisite bite of heavenly scrumptiousness. We can't think of a more perfect indulgence for spring or a more lovely dessert for your next party. We never made French Macarons at Afternoon Tea, although we made tons of the non-French Coconut "Macaroon" variety. Nevertheless, we've fallen in love with these feather-light confections in a big way since then. The Macaron is a French version of a meringue cookie made from whipped egg whites, ground almonds and sugar, baked up puffy and light. Two of these little delicate cookies are sandwiched together with ganache or buttercream for a classic and sophisticated bite of unbridled joy. Today these little gems come in an endless assortment of charming colors and flavors, including coffee, salted caramel, raspberry, strawberry, lemon, orange, green tea, vanilla bean, pistachio, dulce de leche, chocolate and chocolate-mint. With so many flavors to choose from, there's one to please everyone. I have to admit that my love affair with macarons really began when I went to France for the first time. 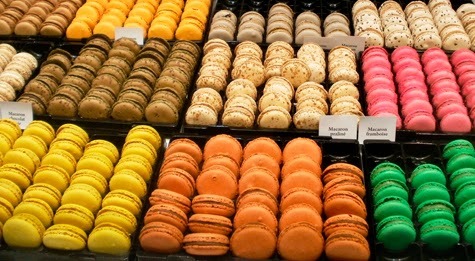 I had heard famed Chef Wolfgang Puck say that the French Macaron was his very favorite treat. It was a sentiment that I had heard others state, as well, which sparked my curiosity. Certainly the packaged commercial almond macarons I had tried up to that point did not inspire that kind of devotion. So I set myself on a little mission to sample one at every French pâtisserie I encountered during my trip, in order to unravel the mystique this little bite of heaven seemed to hold over so many people. With the endless flavors available, sampling one perfect bite at every bakery really did not seem like an over-indulgence at all ... more like reconnaissance work for any professional foodie, or a grand tour of the world of French macarons. 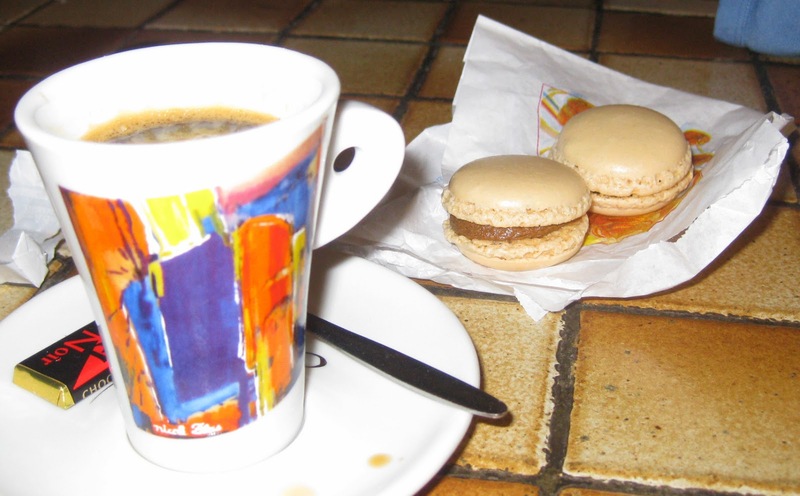 Authentic French macarons with my coffee in Les Houches, France. While I may have missed one or two bakeries here and there along the way, there is no doubt that I was hooked at the very first bite. 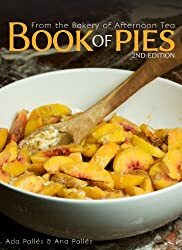 With a mouthful of crackly, light, creamy and riotous flavor, I knew that this would be a love affair that would last a lifetime. Just recently we threw a tea party and included an assortment of lovely macarons from a fabulous local bakery here in Boulder that makes some amazing ones. We enjoyed a variety of flavors, each one more delicious than the next. And they looked so incredibly beautiful on the table, too! They make the perfect centerpiece to any tea party spread, and we wouldn't think of hosting a bridal or baby shower without them. The pastel colors are just too dainty and delightful to pass up. A bevy of colorful lovelies! We're not the only ones obsessed with these adorable little bites of perfection right now, either! I noticed the grand dame herself, Martha Stewart, has macarons on the cover of her magazine this month, as well. Yes, we could easily whip up a batch ourselves ... and don't think that I don't plan to try Martha's recipe! But with the rainbow of colors and flavors available out there, I'm not sure that my tour around the world of macarons is quite over yet! Indulge, mon amis! One delectable bite at a time!